There are four different coloured jeweltypes: blue, red, yellow and green. The blue and red ones are only collectable in horizontal direction, the green and yellow ones in vertical direction. 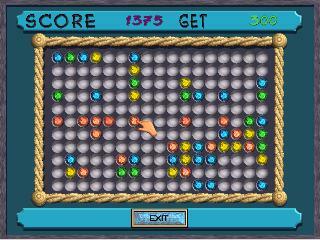 You can change the colour of the stones by pressing the right mouse button. 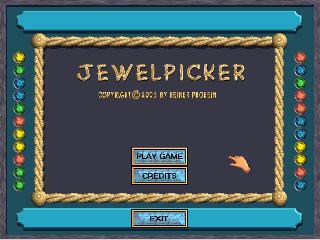 Pressing the left button over an jewel is selecting the row or column. When there ar no other coloured stones between them, the stones are selected. By pressing the left mousebutton again then, the row or column will be destroyed. This game was more a test than a real game. I keep it nevertheless online.